The end of your car restoration project is in sight, and before too long you will be enjoying your newly restored classic car! You have been an important part of your car’s transition from back yard eyesore to art in motion. So, what could be left to do at this point? There are several items that you will want to be aware of as you near the finish line. 1 Understand your restoration shop’s quality assurance process. These steps should be clearly outlined on your shop’s web site. Discuss the specifics of the quality assurance process with your service manager. Does it sound like all areas of the restoration are being addressed? Are there test drives involved, and if so, what conditions are tested? Is the car driven on the highway, or only on main streets? How is the cooling system checked? How many total miles are driven by the shop before you are handed the keys? Who drives the car? Ideally, the car will be driven by the technician, the service manager and by the quality assurance manager. 2 What is the warranty for the work performed on your vehicle? How are the parts and labor addressed in the warranty? Is transportation covered if the car has to be towed back to the shop? If you are an out of town client, this is a critical item. Carefully read the warranty documents and do not be shy about asking for clarification if necessary. If there are items you are concerned about, talk to your service manager or the shop owner to see if there is room for negotiation. Be careful though, there are reasons why the warranty is design the way it is, and you do not want to push the shop to do things that will compromise their ability to run a profitable business. This is and will continue to be a partnership. 3 Are there any marketing opportunities the shop can take advantage of involving your restoration? 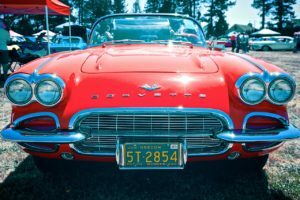 There may be a car show that the shop can attend and feature your vehicle. Let your service manager know if you are open to this idea. Every car the shop completes is an opportunity to display their abilities. You want the shop to be there when you need them, so make it easy for them to do so. Ask for pictures from the event for your records. If the shop features testimonials on their web site, be sure to provide a write up in a timely manner. 4 Get the operating instructions, paper work and warranty information for any major mechanical or electronic components that were installed on the vehicle. Find out how the shop’s warranty and the manufacturer’s warranty co-exist. Does one override the other? 5 Once the car is back in your possession you will obviously need ongoing maintenance. Find out if there are any stipulations regarding the aftercare, and the affect this may have on the warranty. A credible shop will have a stipulation in their warranty regarding this, especially if there was extensive mechanical restoration completed on the vehicle. It may be necessary for routine maintenance to be qualified by the restoration shop. The restoration shop will want to make sure your nephew, brother in law or wife’s second cousin isn’t tinkering with their freshly completed mechanical restoration. In conclusion, you now have accepted the responsibility of caring for a great icon of our past, a classic car or muscle car restoration project you can be proud to call your own. This responsibility is shared and accepted by all the classic car, antique car and muscle car owners that share your passion. This is a serious responsibility that should not be taken lightly. These vehicles share a common thread to our past, when America’s automotive industry was a leading economic force in the world. Yes, these vehicles are beautiful, powerful and amazing mechanical marvels. They are also memories that come alive when you drive.